Elijah Brown (#5) starts the Oregon fast break against the Washington State Cougars at Matthew Knight Arena on Feb. 11, 2018. Basketball in March is all about surviving and advancing the Ducks did both Wednesday night, but barely. 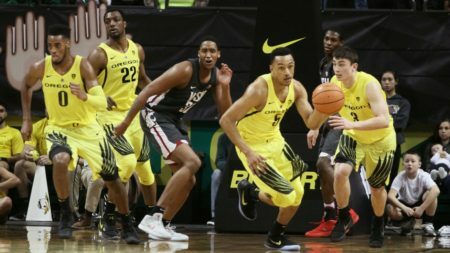 Oregon escaped another upset at the hands of the Cougars with a 64-62 overtime win in the first round of the Pac-12 tournament in Las Vegas. They’ll now face No. 3 seed Utah Thursday night in the quarterfinals. The Utes handed Oregon a 66-56 loss in Eugene in the first conference game of the season way back in December. But before even worrying about Utah, Oregon had to get past a pesky Washington State team. Ernie Kent’s squad held the lead for much of the game, but the Ducks’ pressure finally got the best of the Cougars down the stretch in regulation. Troy Brown’s dunk off of a steal with 58 seconds left gave Oregon a 53-50 lead. But Malachi Flynn’s deep three-pointer tied the game up and Payton Pritchard’s shot at the buzzer didn’t fall and the game was sent into overtime. It was the second contest on the night that needed an extra five minutes of action. Oregon State and Washington went into overtime before the Beavers prevailed 69-66. Although Pritchard’s shot at the end of the second half didn’t fall, his lay-in with 28 seconds left in the game did fall to give Oregon a 63-62 lead. Flynn then drove the lane on the ensuing possession and Kenny Wooten came up with the defensive play of the night with the key block. WSU was forced to foul Pritchard with nine seconds left. The sophomore missed both, but fortunately for the Ducks, Brown grabbed the offensive rebound and was fouled with six seconds to go. He made one of two for the 64-62 lead. Wooten came up big again as he blocked the would-be lay-in that would have tied the game and the ball fell into Pritchard’s hands as the buzzer sounded to give the Ducks the win. Pritchard and Mikyle McIntosh each scored 18 with Elijah Brown adding 10. Troy Brown scored eight to go along with his 11 rebounds. Flynn led the way for the Cougars with 22 points. Oregon and Utah will be the last quarterfinal to be played with an estimated tip time at 8:30 pm on Fox Sports 1.